Simon & Schuster, 9781476776620, 480pp. “[Quammen] is our greatest living chronicler of the natural world. . . .There are vivacious descriptions on almost every page." "Utterly absorbing. . . . Changed the way I see life." “David Quammen proves to be an immensely well-informed guide to a complex story. . . . Indeed he is, in my opinion, the best natural history writer currently working. Mr. Quammen’s books . . . consistently impress with their accuracy, energy and superb, evocative writing." 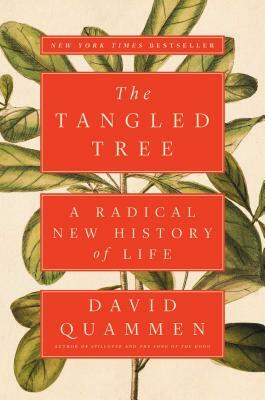 "In The Tangled Tree, celebrated science writer David Quammen tells perhaps the grandest tale in biology. . . . He presents the science — and the scientists involved — with patience, candour and flair." "The Tangled Tree is a thrilling story of some of biology's most incredible discoveries, and a rich portrait of the fascinating people behind them. This is David Quammen at his best: funny, tenacious, lucid, charming, and relentlessly compelling." "In David Quammen’s new page turner, The Tangled Tree: A Radical New History of Life, the author reveals how new molecular techniques have come to revolutionize the way we understand evolutionary processes and how we classify life into coherent groups. In an accessible style that has won him accolades in the past, Quammen does a marvelous job of weaving together the scientific and human story of this revolution. . . . Quammen has once again crafted a delightful read on a complex and important subject." "One of the central insights in Charles Darwin's theory of evolution was that life branched like a tree. And one of the revolutionary discoveries of molecular biology over a century later was that the tree of life was, in fact, a far more complex maze of branches. In The Tangled Tree, David Quammen offers the definitive chronicle of this profound development in our understanding of the history of life." "A lively account of how new genetic research is upending the fundamental history of life." "With humor, clarity, and exciting accounts of breakthroughs and feuds, Quammen traces the painstaking revelation of life’s truly spectacular complexity." "Quammen is one of the great science journalists, and this is a monument of a book—a masterful retelling of how the ‘tree of life’ was recast in the twentieth century by a band of original thinkers." "[Quammen] explores important questions and makes the process as well as the findings understandable and exciting to lay readers. . . . This book also proves its author's mastery in weaving various strands of a complex story into an intricate, beautiful, and gripping whole."